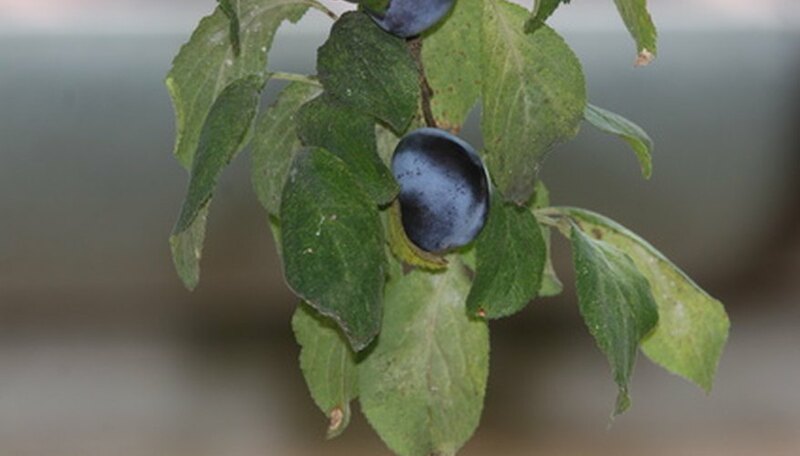 The Stanley plum develops dark purple plums that are ideal for eating fresh, cooking and canning. Stanley plum trees benefit from annual pruning to remove dead and unhealthy wood and shape the tree. Gardeners should prune plum trees late in winter or early in spring, once frost danger passes. Plum trees need less pruning than other types of fruit trees; since the fruits are small and don't weigh very much, they don't stress the branches. Identify dead, diseased and damaged limbs on the Stanley plum. Dead limbs don't move with the wind and feel hollow to the touch. Diseased and damaged limbs appear deformed, discolored, bruised or wounded. Remove this wood for the health of the tree whenever you notice it or as part of a major pruning job. Cut off the unhealthy wood at its base or by trimming back to a healthy side branch. In between each cut, spray your lopping shears with disinfectant to avoid accidentally infecting healthy limbs. Cut away any limbs that crisscross one another, since the friction from rubbing will eventually damage the wood. Doing this opens up the canopy for increased air circulation. Trim back limbs that have grown too long, making your cut at a 45-degree angle just beyond a bud or swollen tissue. Use anvil pruners for these cuts. Cut off low growing limbs that impede movement under your plum tree. Remove any limbs that angle downward and any suckers that grow from your plum tree trunk.